Ruth: I've noticed that you fall asleep everywhere. Akane: Oh, you've noticed. Oh, no, it's actually a problem that I have. Akane: Yeah, I do get sleepy. Ruth: Well, it's just that whenever we come back from work, or we go to work, you always fall asleep on the bus. Akane: I do. I'm so tired in the mornings. Ruth: So, you're tired in the mornings (Mm-hm) so don't you sleep at night? so I think it's the early mornings that really get to me. you really do seem to sleep far more than anybody I've ever met. Akane: Actually, yeah, my father does say that he falls asleep at work. Akane: Yeah.And my mom falls asleep at work as well when there's not costumers. Akane: Yeah. Yeah. So it runs in the family. Ruth: So have you ever done that? 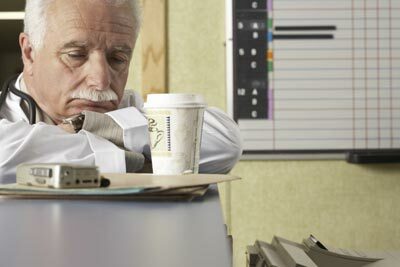 Have you ever fallen asleep at work? Akane: Actually, well, I don't fall asleep when I'm teaching, cause its such a busy job (Yeah) but when I was working in an office, when I was doing medical research, it was such a boring job that I did used to fall asleep in front of the computer sometimes. It's really embarrassing. Ruth: So have you ever had an embarrassing moment when you've fallen asleep? and it was beautiful music and I was enjoying myself but I just fell asleep in between. Ruth: So how many hours sleep do you normally get Akane? so I'd say on average about eight and a half hours. Ruth: Eight and a half. Ruth: Well, I suppose if you add that to the five hours a day that you sleep that's quite a lot. Akane: If you put it that way. I think it's the early mornings that really get to me. The sound of her voice just gets to me after a while. Doesn't it get to you that you never get a vacation? So it runs in the family. Heart disease runs in the family. I see that good looks don't run in your family. I was working in an office, when I was doing medical research. I was at the library doing research for my biology report. Did she research the best hotel to stay at in Rome? It was such a boring job that I did used to fall asleep in front of the computer sometimes. I always thought science was boring until I had him for a teacher. That is a really boring movie. One time we went to watch the symphony orchestra. Do you enjoy going to the symphony? The symphony music in the in the background made the movie more suspenseful. Tonight we will be going to dinner and the . Being tall just kind of runs in the . This music really to me after a while. I can't watch this movie anymore. It's too . Our teacher wants us to do on the building of the Panama Canal.